The last time I saw Dan Haren in the clubhouse, I wanted to hug him. He was a part of a young Cubs team that was about to enter the postseason ahead of schedule. He was also about to retire, though, and I didn’t peg him for one who’d work in the game after he was done. I didn’t know when I’d see him next, and he’d been a go-to source for many of my pieces. This happens more often than we might imagine, this bit of deflation right in the middle of so much elation. For many players, their last appearance in a major-league game also represents their last day in baseball. The effort to be here now, to be fully present in the moment, is an ongoing one — and a difficult one when it comes to baseball. For example: as much as I’m in love with the present version of Bartolo Colon, I sometimes remember fondly the days when he threw gas — and threw something other than a fastball. I’ve had the opposite experience with Rafael Devers recently: as impressed as I am by his abilities right now, I can’t help but think of his future whenever I watch him. Contemplating CC Sabathia in this context yields a slightly different experience. The left-hander debuted as a 20-year-old and began producing above-average numbers right away. Over the course of his age-35 and -36 seasons, meanwhile, he’s recorded nearly seven wins. In terms of his capacity to prevent runs, the Sabathia of 2017 isn’t much different than the Sabathia of 2001. As such, Sabathia offers a unique means by which to experience nostalgia for yesterday, the immediacy of today, and the hope for tomorrow all at once. That version of Sabathia overwhelmed hitters for basically a decade. By 2011, he featured that fastball, two breaking balls, and an elite change. That season was the second best of Sabathia’s career. This is where he threw his four-seam fastball, back when he had the lowest pull percentage of his career and second-highest soft-hit percentage. High and away is a difficult location for a hitter. It looked impressive back then, too. Lest we fall too much in love with the promise of the past, like Willy Loman in Death of a Salesman, we should remember how good it was when it was good. That was impressive. But also, it wouldn’t last. Just a year later, much had changed. Sabathia soon battled his first elbow injuries, and his velocity dropped a tick and a half. Offseason surgery to remove bone chips may have had him feeling upbeat about 2013, but he lost another full tick. The result? The first really terrible season of his career. 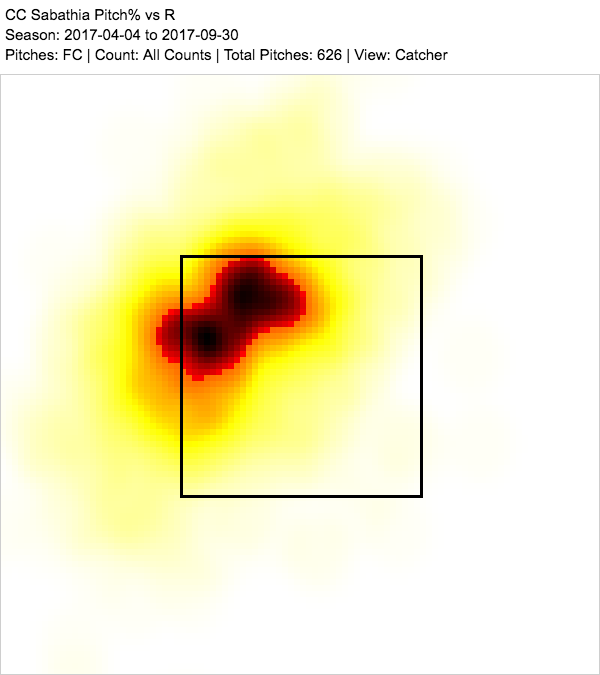 Here’s where he was throwing the four-seamer in 2013. With such a rapid downfall, you had to know it wasn’t just velocity that was hurting Sabathia. Looks like those arm injuries also zapped his fastball command. He was throwing middle-middle with reduced velocity. In what was probably a related development, he gave up 50% more home runs in 2013 than he ever had before. But this isn’t just a sad story of what once was. There’s a different Sabathia on the mound tonight, a resurgent one, a top-50 starter worthy of at least a couple innings in a series-deciding game for the Yankees. The triumph, of course, comes from ditching that four-seamer almost completely. Since the cutter hums along about 2 mph slower than even today’s reduced four-seamer, it’s tempting to focus on the movement. It’s two inches difference of horizontal movement with two more inches of sink, and it fits right into the narrative that older pitchers go to their junk more often as they get older. 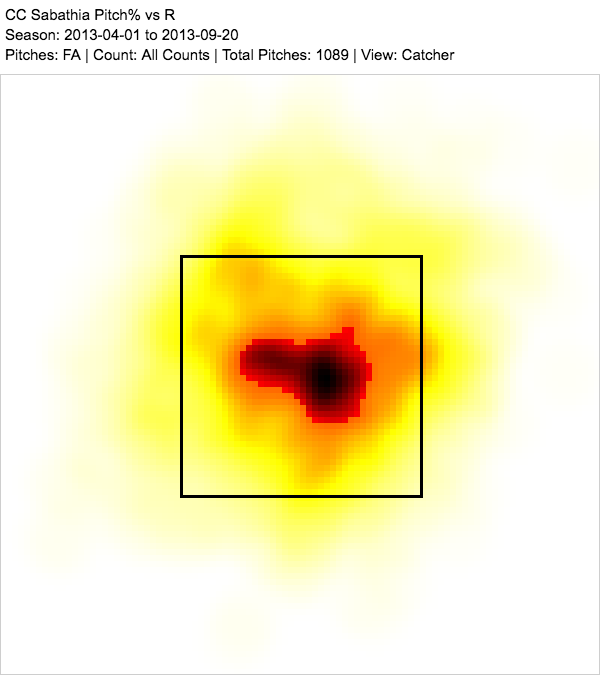 While it’s true that age and fastball usage are negatively correlated, this is a cut fastball we’re talking about here. The difference isn’t so much about movement as it is about command. 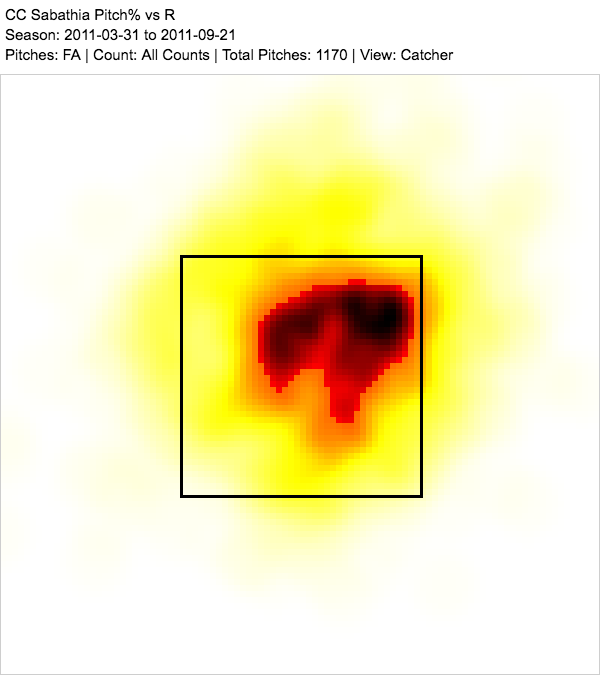 Take a look at where Sabathia has thrown the cutter to righties this year. 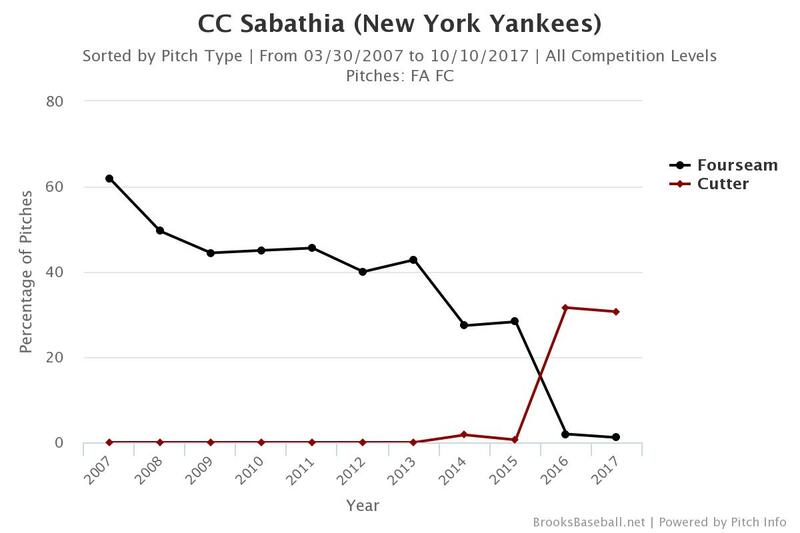 This one doesn’t generate quite the same tingles as the earlier example, but it does highlight a cool thing about Sabathia. He’s thrown hard stuff inside to righties 18% of the time the last two years, almost twice as much as the rest of his career (10%). Instead of setting up his changeup on the outside corner with a high and outside fastball, and mixing it up with inside / backfoot sliders, Sabathia is now setting up his outside changeups and outside corner sliders with hard cutters inside. It’s a testament to wisdom, to the ways that we can reinvent ourselves even as time takes us further from our peak. It’s something we should see tonight. And, given his work with charity and affability, no matter the result tonight, we’re sure to see a Sabathia that is both a part of the game and part of something bigger going forward. He’ll probably have yet another act that we can anticipate. Looking back just enough makes us sad for the Sabathia that once was, but also gives us a deeper appreciation for the Sabathia that is now, and the Sabathia that might be. We should always live in the now as much as we can — that way we get the most out of each moment — and yet looking back and looking forward can also enrich the present. This is a paradox, but one we can solve by settling into our seats and enjoying the sight of this grand lefty wearing the uniform of the team that signed him in order to take on the team that drafted him, for one more big game. We hoped you liked reading The Death of a Fastball, with CC Sabathia by Eno Sarris! Did Masahiro Tanaka kill it? and then it was reborn as a cutter!